The Liverpool player was annoyed in a news conference on the eve of the semifinal by English media asking about a 4-1 loss against Tottenham early last season. England captain Harry Kane, who got two goals for Tottenham that day, did not score Wednesday in Moscow. Lovren says he doesn't understand why reporters should look back and ask about his mistakes. "People should respect us more," Lovren says. Croatia will be playing in the World Cup final for the first time when it plays France in Moscow on Sunday. Ivan Perisic recalls being a little boy wearing his red-and-white checkered shirt as he watched Croatia previous World Cup semifinal against France in 1998.He says he watched on TV in Split when Croatia lost to the French, who went on to win the title. "I rooted for Croatia wearing the Croatia jersey," he said. "I could only dream of playing for my country and of scoring one of the important goals in a final." Perisic scored the equalizer and contributed to clinching goal as Croatia rallied to beat England 2-1 in extra time to reach the World Cup final for the first time. To win the championship, they'll have to beat France on Sunday.He spent a couple of years in his childhood living in France but says that's "irrelevant" now. "No one can be happier than me to play them in the final," Perisic said. "I spoke to my mother the other day. She said she dreamed that Croatia will play France in the World Cup final. Now her dream is becoming reality — we will see what happens." Harry Kane and his England squad stayed on the field long after the 2-1 extra-time loss to Croatia, acknowledging the thousands of traveling fans who'd come to Russia to see the Three Lions play in a World Cup semifinal for the first time in 28 years. England took a lead in the fifth minute with Kieran Trippier's free kick and held it until the 68th when Croatia equalized. Both teams had chances to score before Mario Mandzukic scored the clincher for Croatia in the 109th. Kane, who leads the tournament scoring list with six goals, says the hurt is going to last a long time. The England captain says "It hurts a lot. It's going to hurt for a while, of course, but we can hold our heads up high." England came so close to returning to a World Cup final for the first time since winning the title on home soil in 1966. Confidence was building in England that Gareth Southgate's group of young players could end the long drought. Instead, England will meet Belgium in the third-place playoff on Saturday. Kane says "It's been great to get to this stage but we wanted to keep going. I don't know what else to say. It just hurts." Croatia is going to the World Cup final for the first time after beating England 2-1 in extra time. Mario Mandzukic has given Croatia a 2-1 lead over England in the second half of extra time in their World Cup semifinal. The Croatia forward latched onto Ivan Perisic's header and rifled the ball past England goalkeeper Jordan Pickford in the 109th minute. That left Croatia 11 minutes away from its first ever World Cup final, and England needing a goal to have any chance of reaching its first World Cup final since winning the title in 1966. 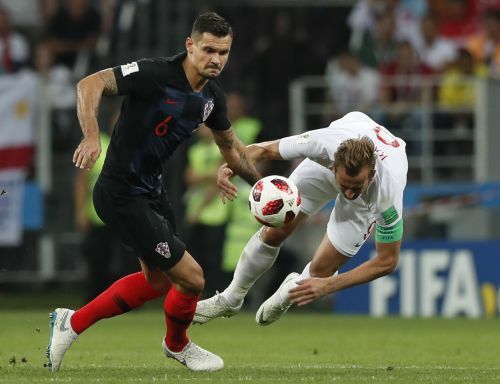 England and Croatia's World Cup semifinal is still level at 1-1 midway through extra time after Croatian defender Sime Vrsaljko blocked a shot on the line. Neither team has managed to score since Ivan Perisic's 68th-minute volley leveled the score. England had opened the scoring with a fifth-minute free kick opener by Kieran Trippier. Croatia's Mario Mandzukic went down hurt in added time after colliding with England goalkeeper Jordan Pickford, who blocked his shot. If the game goes to penalties, Croatia becomes the first team to play three shootouts at a single World Cup. The winner here will return to Lizhniki Stsadium on Sunday to face France in the final. England and Croatia are going to extra time after the World Cup semifinal finished 1-1 in regulation. Ivan Perisic equalized with a volley in the 68th minute after Kieran Trippier's free kick in the fifth had given England an early lead. Perisic nearly followed up with a second goal moments after his first but he hit the post for the second game in succession. With England barely clinging on in the latter stages, Jordan Pickford saved a shot from Mario Mandzukic. Shortly after, Perisic scooped the ball over the bar with Pickford out of position. It's the third consecutive game the Croatians have taken a game to extra time. They beat Denmark and Russia in penalty shootouts. England won a penalty shootout against Colombia in the round of 16, but beat Sweden 2-0 in the quarterfinals. The winner will return to Luzhniki Stadium on Sunday to face France in the World Cup final. However, FIFA has decided that the sentence is not final because the former Dinamo Zagreb director general is appealing to a higher court.